Austin, Sheila and Oliver Stack after a meeting with then Taoiseach Enda Kenny last year. THE FAMILY OF a prison officer shot dead by the IRA almost 35 years ago has accused gardaí of not acting on information they received. Brian Stack’s family claim the information is “very significant” and was not passed to the investigation team. The family says the information has been held on file at garda headquarters since 1990. Austin Stack, the son of the prison officer, is calling on the Taoiseach to “demand answers from the Garda Commissioner over this”. Austin Stack says the family’s claim that significant information exists comes from a retired member of the force. “I was told in November 2015 by a retired senior garda that significant information which had come from an IRA informant was passed to the gardaí in 1990 and that this information contained details of those responsible for my father’s murder,” Austin Stack said in a statement. Austin Stack added that the retired garda told senior members of An Garda Síochána of the information in 2013 and that the family themselves raised it during a 2016 meeting with the investigation team and an Assistant Commissioner. 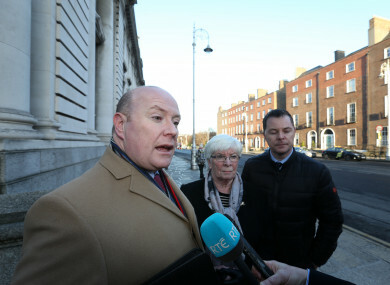 Speaking to RTÉ Radio One’s Today with Sean O’Rourke, Austin Stack said: “There was some very parliamentary language used towards us at that meeting and since then my mother has point blankly refused to meet with An Garda Síochána. My view is that they are protecting an informant. That’s the view that has been put to us by the investigation team. When asked by O’Rourke if he knew the names of the individuals he was referring to, Austin Stack said yes. “I do, I know the individual. I’m quite confident that I know the names of the individual who drove the bike, who shot my dad and who sanctioned the murder. There was one individual who was living in the 26 counties, another one is living in the United States,” he said. Sinn Féin leader Gerry Adams facilitated a 2013 meeting between Austin and Oliver Stack and a man who gave the brothers information about the 1983 murder of their father. The brothers were taken to the meeting with the former IRA leader in a blacked-out van and Adams has said that the meeting was arranged on the basis of confidentiality. In a statement released this afternoon, An Garda Síochána said that “in order to protect investigations”, it “does not comment on the detail of on-going investigations”. An Garda Síochána does not comment on remarks by third-parties. It added that the investigators leading the investigation relating to the death of Brian Stack “are satisfied that they have been provided with all the relevant information they require from within An Garda Síochána”. The investigation team is receiving the cooperation of all relevant sections within An Garda Síochána in order to pursue all possible lines of enquiry. An Garda Síochána maintains regular contact with the Stack family for the purpose of keeping them informed of any relevant developments in this investigation. An Garda Síochána is determined to bring the investigation into the death of Mr Brian Stack to a successful conclusion. Email “Family of prison officer shot dead by IRA says gardaí didn't act on 'significant information'”. Feedback on “Family of prison officer shot dead by IRA says gardaí didn't act on 'significant information'”.